Paneer makes for a great and healthy filling in this flavourful vegetarian sandwich/burger. Heat a non-stick frying pan, at a moderate and add the oil. When hot fry the Paneer pieces golden brown on each side. Turn down the heat add the butter and tandoori powder. With a spoon baste the Paneer with the foaming tandoori butter for 1 min. Start by slicing and toasting the bread on both sides. 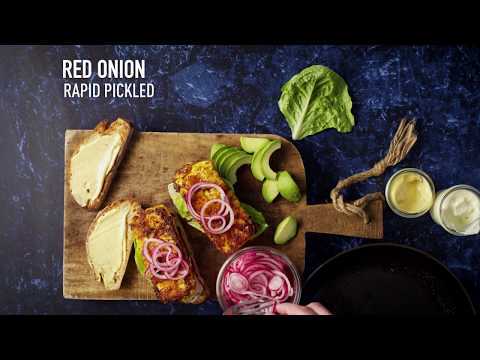 Spread mayonnaise on to pieces of bread, top the pieces of bread with 1 or 2 leaves of lettuce, Paneer, avocado and pickled onions. Spread the remaining two pieces of bread with mustard and “close” the two paneer sandwiches.